Born in 1972 in Saint Joseph, Missouri, Marshall Bruce Mathers, III, more commonly known as his rapping alias Eminem, spent most of his early life in the Detroit, Michigan area known as 8 Mile, which separates Wayne County and more affluent counties to the north. Much of what people think they know about Eminem is what they learned from the semi-biographical movie "8 Mile," and while many of the events, locations, and music mirrors that of Marshal Mather's real life, it's a fictionalization that takes a lot of creative liberties with the retelling of becoming a famous rapper from Detroit's 8 Mile. In any case, if you're a fan of Eminem and want to see some of the locations that inspired the movie and music that made Marshall Mathers famous, there are a few places worth checking out on your trip to Detroit. However, you should be aware that some areas of 8 Mile are dangerous, especially at night, so it's best not to linger as a tourist in some neighborhoods. In interviews, Eminem has stated that he grew up on the wrong side of 8 Mile, meaning the Detroit side; but the many biographical records out there show that he moved to the Detroit area with his mother when he was 12 and went to school in Macomb County. According to some sources, Eminem attended Dort Elementary school in Roseville and Osborne Middle School and Lincoln High School in Warren, which is a predominantly white community less than a mile from the famous divide of 8 Mile Road. Eminem dropped out of high school after failing the ninth grade for the third time in 1989 and worked at Gilbert's Lodge in St. Clair Shores in Macomb County, where he would often perform, until 1998. While exactly where he lived as a child is disputed, he did grow up poor and moved around a lot like his character Jimmy Smith, Jr. in "8 Mile." He also struggled to break into rap as a white artist, hustling his music to record stores in Roseville and Warren and participating in rap battles at famous Detroit hip-hop venues. As Eminem emerged as an artist after high school, he went by his initials M&M and spat lyrics that were much lighter than those for which he would eventually become famous. The "Infinite" album that was released in 1996 focused on love and making it big; while not without foul language, M&M’s music was designed to be playable on local radio stations. As noted by M.L. Elrick in his Salon article "Eminem’s Dirty Secrets," Mather's evolution as an artist can be traced by his various artistic monikers. 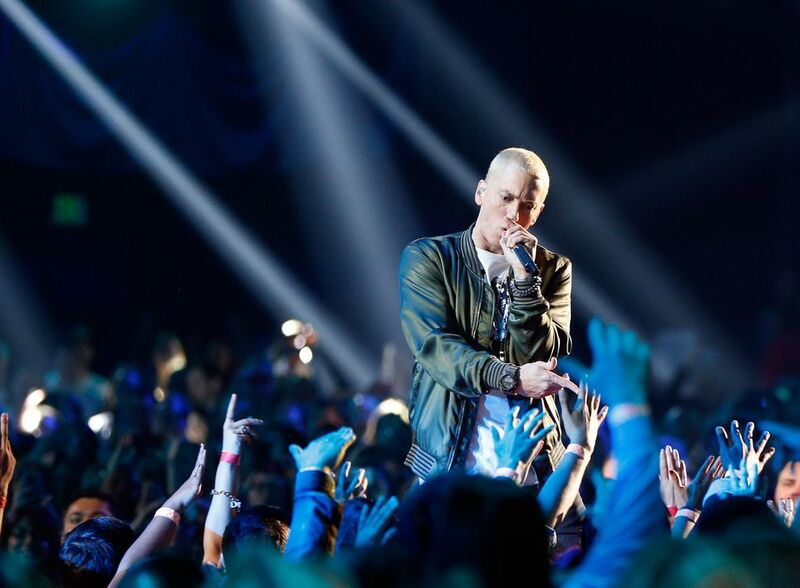 In 1995, the same year his daughter Hailie Jade Scott was born and that he cut tracks in Ferndale for his "Infinite" album, he changed his rapper name from M&M to Eminem. If Eminem was an incarnation created by Mathers after he immersed himself in the hip-hop culture, Slim Shady was his evil alter ego. As Mathers continued to struggle professionally following "Infinite’s" release, he tried to cope with handling the sudden fame and still being there for his newborn daughter—a period in his life that did closely resemble the Jimmy Smith character in "8 Mile." In 1997, Eminem participated in the Rap Olympics in Los Angeles, and although he came in second, he was spotted and his demo tape eventually made it to Dr. Dre, who helped turn his 1998 "Slim Shady EP" into an LP in 1999. This was followed by the "Marshall Mathers LP" that won three Grammy Awards. Much of the film "8 Mile" was shot in Detroit and the surrounding suburbs, including on sections of the famous 8 Mile Road. However, many of the locations were been renamed for the movie and many buildings and sets were repurposed for filming. While you can always visit Eminem's childhood neighborhood or schools for a glimpse into his past, a few existing spots will be familiar from scenes in "8 Mile." The A&L Mobile Home Park on 8 Mile Road in northern Detroit was used for this location, which is where Jimmy Smith's mother lives and where he has to move after breaking up with his girlfriend. This relic of the past still sits atop an abandoned ice cream shop on Mack Avenue in Chandler Park, which is several miles south of 8 Mile Road. In the film, Jimmy Smith and his crew called Three One Third shoot paintballs at this plastic cow head. Located in downtown Detroit on Michigan Avenue, this former theater is now an office building but served as the backdrop for a lyrical battle between Three One Third and Free World in the movie. This Bricktown venue on Beaubien and East Congress streets is where Eminem really got his start as a rapper. However, the movie version called "The Shelter" was filmed in an abandoned factory in the Rivertown Warehouse District that is not accessible to the general public. Filmed at a factory still in operation in the New Center district of Detroit called New Center Stamping, this is where Eminem's character works during the movie when he's not busy rapping or getting into trouble. Check out some of the other free things you can do in Detroit.